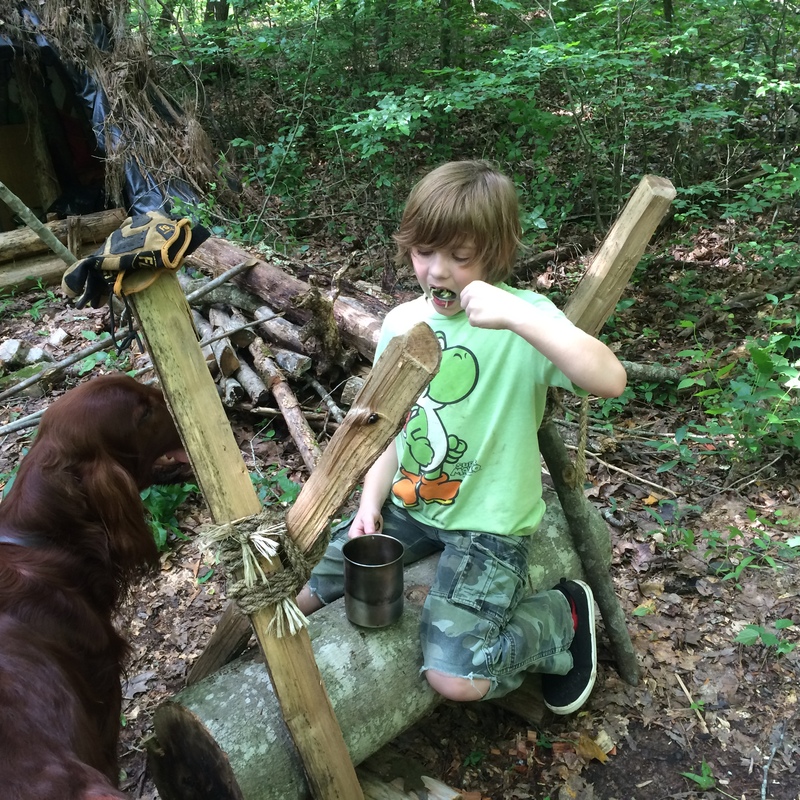 Last summer I took my 7-year-old grandson to my shelter in the woods for a little dirt time and some quality Pops and Max bonding. 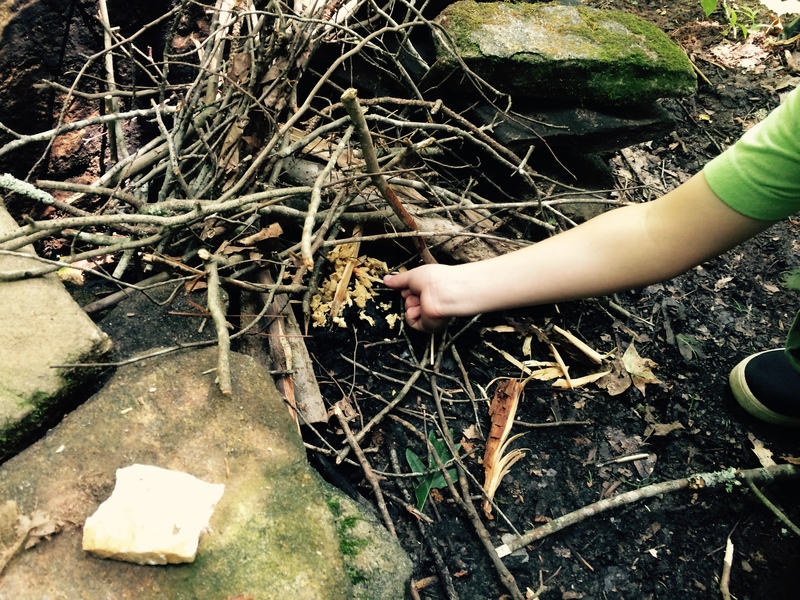 We gathered up some dry material for our campfire. We laid everything out in three piles; tinder, kindling, and fuel. It never crossed my mind to warn Max about the shower of sparks that was about to rain down on the volleyball-size tinder bundle. “Whoa! Whoa!” he panicked and scurried away from the area. Granted, the big ferro rod I use is like watching fireworks explode. But once the fire was going, Max found it difficult to even stand near the small campfire without some reassurance and coaxing. He was down right scared of fire. The “Stop, Drop, and Roll” fire safety campaign in school showed how fire could destroy your house, your family, pets, and even you. An irrational fear of this wonderful tool of self-reliance smoldered within his psyche. How could I help him learn to use fire safely and overcome his fear? Matches light birthday candles. That’s a happy time, right? One reason Max (and maybe your child) was afraid of fire is that no one had taken time to teach him how to safely strike a match. We stepped out back to Pops Shop, pulled up two stumps, and opened a box of kitchen matches. As adults, use the E.D.I. approach… Educate: teach the skill and cover safety concerns, Demonstrate: doing the stuff yourself, Imitate: allow your child to imitate the skill). Ask your child if they’ve ever attended a birthday party where the cake exploded into flames and burned the house down. It sounds silly but your child needs to make the connection between a controlled fire that is useful and the potential danger of unattended flames. 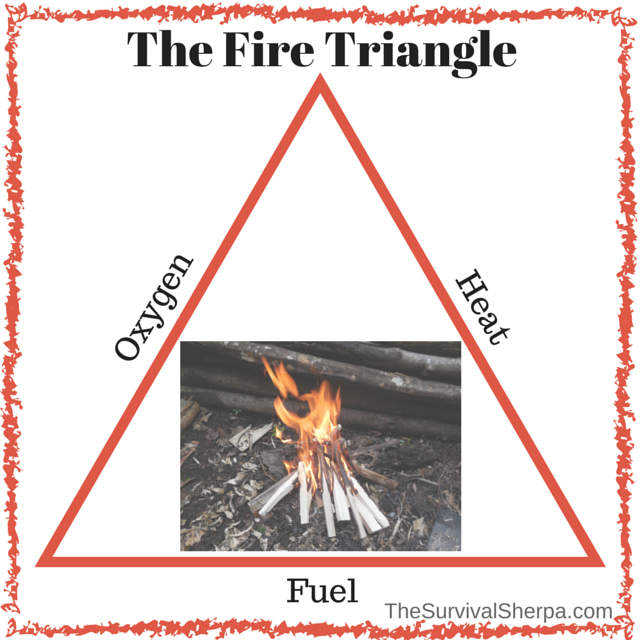 For a match to burn, the three sides of the triangle have to be complete… heat (ignition source – friction), oxygen (air), and fuel (the wooden match stick). Fire and heat rise. The flame will not suddenly run down the match stick and burn your fingers. Find a spot that isn’t windy, indoors or out, strike a match and hold it vertically for your child to observe. He will notice that the flame will burn a short time in a vertical position before going out. Now have your child hold an unlit match vertically. 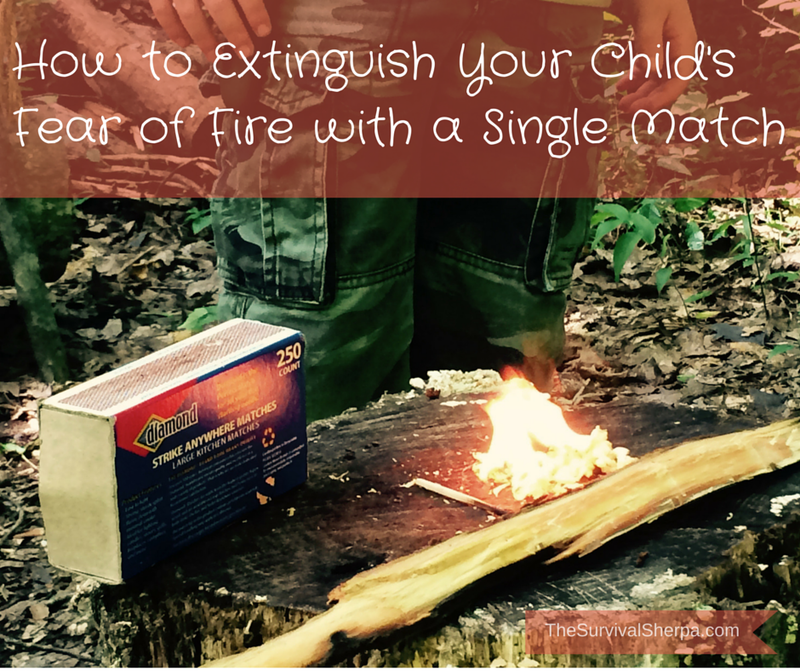 Light another match and hold it vertically next to your child’s match head until his ignites. Have your child hold steady and watch his match extinguish in a swirl of smoke. Repeat the process with two new matches. Next, have your child hold the match horizontally once it is lit. The flame will slowly burn towards his fingers in a controlled manner. About halfway to his finger tips, have him blow it out like a birthday candle. It’s likely he will feel the warmth of the flame on his finger tips. That’s good. Ask him if he was burned or in pain. Safety Note: Be sure the demonstration area is clear of flammable material. Use a metal bucket or dinner plate to discard the spent matches. A child may panic and toss the burning match to the floor or ground. Now is the moment of truth. Will he strike his own match into flame? Give a brief demonstration of how to strike a match. Strike away from your body. This was a bit awkward for me as I’m used to striking towards my body and cupping the burning match to create a wind screen. Use wooden kitchen matches because they are more sturdy, longer, and easier to strike for beginners than short wooden matches and paper matches. Have your child hold the non-flammable end between his thumb and middle finger. Move his index finger down the match stick to apply pressure on the match head as it passes over the striker strip of the closed match box. Make sure he understands to move his index finger down towards the non-burning end after ignition. Just saying. Max tried and failed his first few attempts. He was using a poor angle with the match head on its side. Coach your child to hold the match at just under a 90 degree angle and perpendicular to the striker strip. This process is simple for adults. But remember, your teaching a child who has never lit a match. Make sure that he holds the box firmly and strikes the match away from his body. I suggested that Max prop the corner of the match box on a solid surface for added support. The last thing you want is for a piece of burning match head to land on his body and further burn the fear of fire in his mind. Use as many matches as needed for your child to achieve ignition. Once he succeeds, have him hold the match vertically until it burns out on its own. Then repeat until he’s comfortable. Be generous with the high-fives and fist bumps! 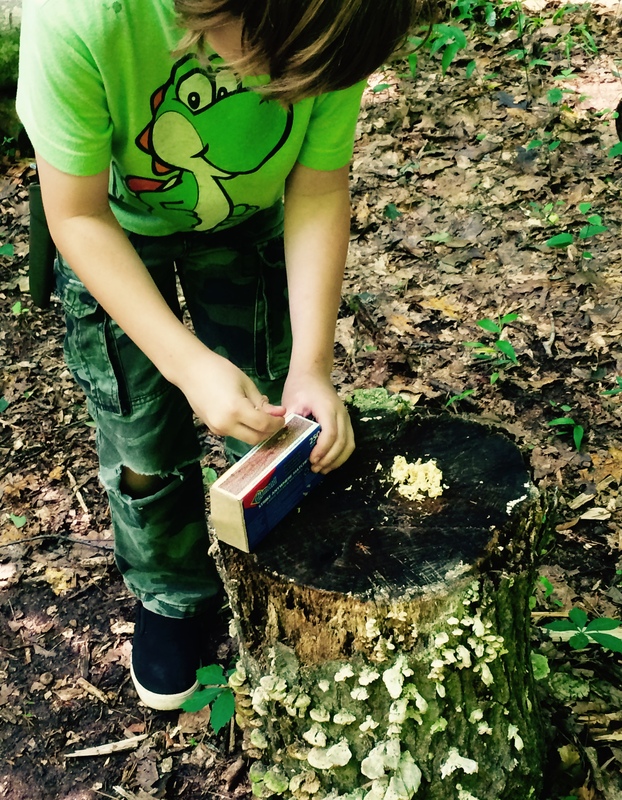 With supervised practice and coaching, Max burned through half a box of matches building fire craft skills and destroying his fear of fire. Enjoying his Ramen noodles we prepared over the campfire he built! 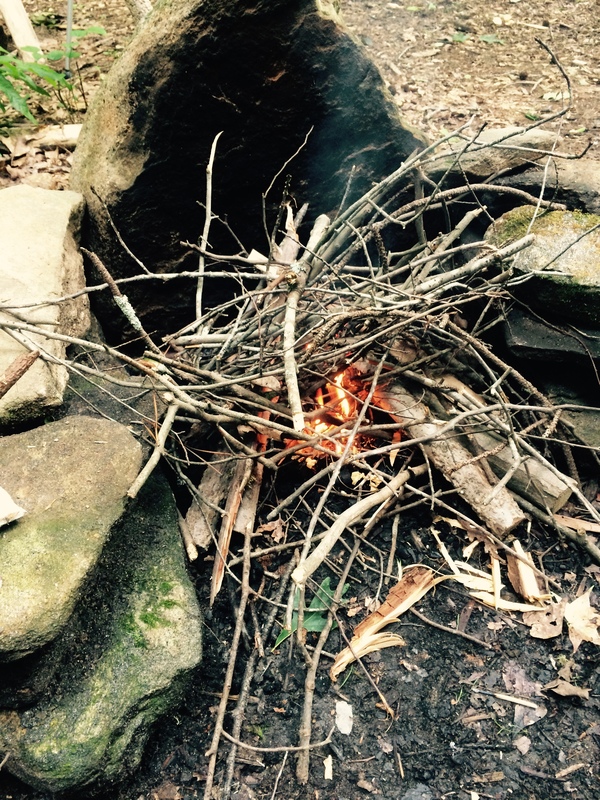 Not much is more beautiful in our world than cooking Ramen noodles over a fire my grandson built! Click here for more on our Boomproof Fire Craft Series.